Although the whale shark, Rhincodon typus, was first discovered way back in 1828, there are only 21 confirmed reports of neonate whale sharks globally. In this species, a neonate is generally defined as an individual measuring 1.5 metres in length or less. Whale shark researcher Elson Aca supports the neonate whale shark before collecting data on the animal and releasing it back into the wild. In 2009, a ‘baby’ whale shark specimen was found off the coast of Donsol, Philippines by local fishermen who immediately called the World Wide Fund for Nature-Philippines to the scene after tethering the sharks tail with some line to keep it from escaping. 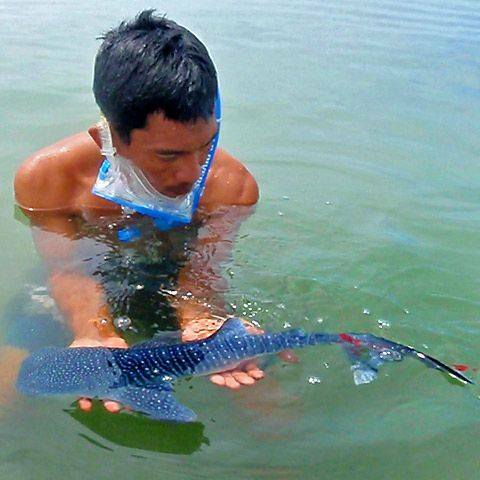 Whale shark researcher Elson Aca is pictured supporting the tiny example of the earth’s largest fish. The shark, measuring just 15 inches / 38 centimetres, was later released over deep water. So why have so few neonate whale sharks been seen? Well firstly to explain that mating and birthing areas for the species are unknown globally. It is generally believed that whale sharks are born in very deep water and spend the first year of their lives at depth where there are less predators than in shallow water. The spots and stripes pattern on their dorsal surface and flanks are thought to break up their outline to predators looking from above or the side. Once they reach around 2 metres (approximately one or two years old) they make their way to shallow coastal areas forming seasonal feeding aggregations.